Auburn’s incredible Final Four comeback against Virginia was stopped short thanks to some officiating decisions that were, let’s say, a little questionable. It shouldn’t surprise you that the fans of the losing team, Auburn, were a little emotionally distraught after the fact. What made their level of agony much more intense was the juxtaposition of how elated they were just moments earlier, when some Tigers fans started celebrating their team’s championship berth before realizing a foul had been called. Here’s that emotional thrill ride in real time at a bar in Birmingham. One of the patrons, who had celebrated by leaping into the arms of someone, was so angry that she slammed her purse on the floor. She was the only one making noise as the other fans had been stunned into silence. This also happened at Auburn’s campus. Students ready to set the city ablaze ran out onto the streets to wave flags, throw toilet paper on trees and celebrate their conference having a representative in the final with “S-E-C!” chants, for some reason. The true victims here are the ones who have to clean up the mess that was made for nothing. Not even U.S. Bank Stadium was immune to such extreme feelings on both ends of the spectrum. 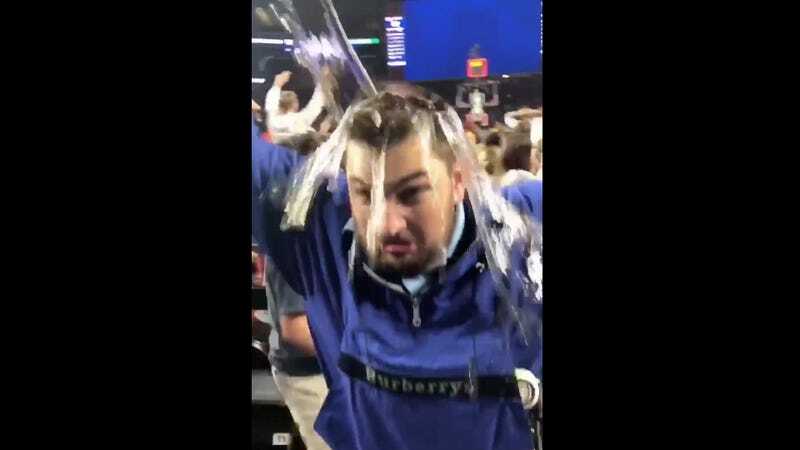 In one case, an absurdly excited Auburn fan gave himself a Gatorade bath but with overpriced beer instead. Moments later, he was arrested and escorted out of the stadium (a follow-up tweet clarifies that the guy was belligerently kicking chairs after the loss, not for pouring beer on his head). Of course, no March Sadness compilation would be complete without former Tiger Charles Barkley slowly realizing his team just sent one of the country’s best free throw shooters to the line with a chance to win the game. Let’s hope some of these clips make it to the One Shining Moment reel! Northwestern Officials To Shrieking Superfan: "How About We Not Do That Anymore?"